Hristo Stoitchkov was one of Europe's best players in 90's and also one of the bad boys of European football. He managed to combine greatness on the field with a hot temper that sometimes got the best of him, but all geniuses have a bit of crazy in them, and Stoitchkov was no different. USA hosted the World Cup in 1994 and Stoitchkov didn't miss the party. Finishing first during their qualification group, pushing a heavy favorite France to second place, Bulgaria was able to get their ticket to the summer's showcase event, and it wouldn't be a world event without Stoitchkov. 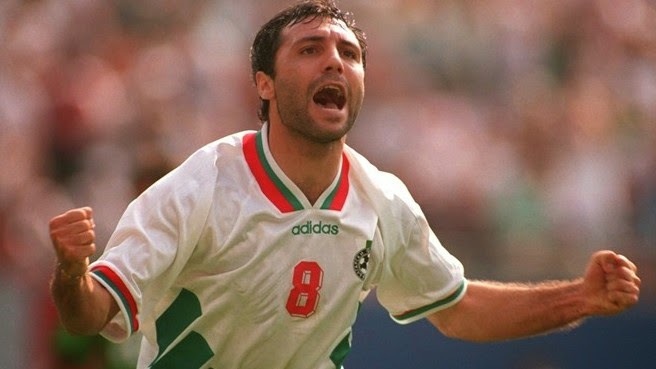 The World Cup campaign didn't start in the best of fashions for Bulgaria or Stoitchkov. After a 3-0 loss to Nigeria to kick off the group stages, aspirations to pass the group stages looked bleak, considering they would still have to face Greece and Argentina, which were a heavy favorites to win this tournament. Bulgaria defeated Greece 4-0 with Stoitchkov scoring 2 goals from the penalty spot and getting the assist on the 4th goal. Now came the marquee matchup against Argentina. Argentina had won the first two games, but still needed at least a tie in order to advance and for Bulgaria only a win would put them through. Bulgaria won 2-0 with Stoitchkov scoring in the 61st minute to put his Bulgaria into the round of 16 and sending the Argentinian team home. In the round of 16, Bulgaria would face Mexico. Mexico finished first in a group that saw Italy finishing 3rd and being eliminated from the World Cup, so this Mexico team would be a very difficult opponent for Bulgaria and Stoitchkov. The game started well for Stoitchkov, with a goal in 6th minute to give Bulgaria the lead. Mexico later tied the match and extra time didn't solve anything, so it was on to penalty kicks. Stoitchkov wasn't elected to take any of the penalty kicks but Bulgaria won 3-1 and advanced to the Quarter Finals of the tournament where they were going to go head to head with Germany. Germany was a heavy favorite, not only at winning this match but at winning the tournament. This was one of Germany's best teams and they had won the previous World Cup, but Stoitchkov didn't care about that, he was about to have the game of the tournament and move himself into World Cup history with his performance on that day. Bulgaria would score again 3 minutes later and one of the biggest upsets in footballing history was completed. It was on to the semi-finals and a match against another heavy tournament favorite, Italy. Stoitchkov scored his final goal of the tournament against Italy in a 2-1 loss, and his performance in that game was not as vibrant as in the previous match against Germany. They Cinderella run had ended, but they would still play a match against Sweden for 3rd place in the tournament. Bulgaria lost the match to Sweden 4-0 and finished 4th place in the 1994 World Cup, this still is the best ever finish for Bulgaria. Stoitchkov was joint Golden Boot winner with Oleg Salenko and was voted into the tournament's All-Star team. That summer Stoitchkov showed the world his true potential and greatness by caring Bulgaria on his shoulders to their best tournament finish ever, for his performances during the tournament he will always be a World Cup Hero.